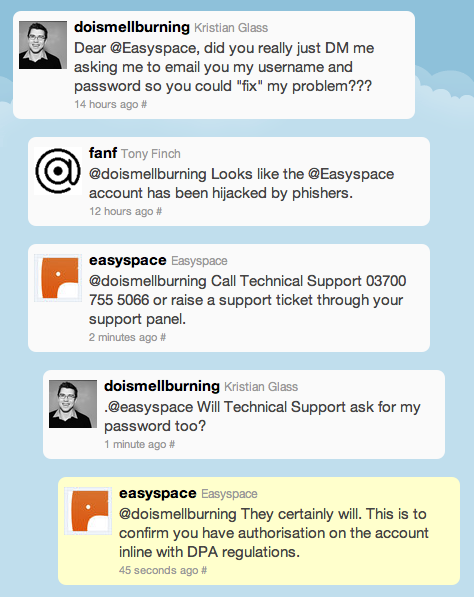 Goodbye Easyspace... - Kristian Glass - Do I Smell Burning? I recently acquired control of a number of domains managed with Easyspace. While the user interface isn’t as clean as my current service of choice (Retrosnub), it seemed good enough. It wasn’t very long before I ran into an unfortunate issue. Every time I tried to add or delete a DNS entry, I’d be presented with a shiny happy “Success!” message and sent back to the domain list. I’d then see no evidence of my change. So sometimes, it emerges, that this is just because they lie: “Success” doesn’t mean “Success”, it means “I’m sorry, but we won’t let you point a CNAME to a CNAME” (not a wholly unreasonable position to take, but not required, and seemingly viewed as outdated). Sometimes, it just means they sort-of-lie: “Success” means “Success, but our UI won’t update until you’ve logged out and back in again”, so the UI will display stale data - less of a lie, about as irritating, especially as it’s indistinguishable from lying-Success. No, I am not emailing my password to socialmedia@yourdomain. I don’t really care if you are a legitimate representative of Easyspace, I’m not sending you my password, and for you to ask me to is pretty awful. Apparently they need my password “for DPA reasons”. Insane. By all means, “please go away and file a support request”, but asking for my password? I feel Tony sums it up perfectly. Well, in December 2011, Amazon released a GUI for route53, their highly-available and scalable DNS service. Looks like an excellent candidate to migrate to - after the above, I have no intention of continuing dealing with Easyspace any further.